“For the past few weeks we had the wonderful opportunity of interning at Upper Deck. This has been a fantastic first internship for the both of us! We were surrounded by a supportive and helpful team and gained valuable hands-on experience in areas such as marketing, research and customer care. “Much of our time at Upper Deck revolved around the development and promotion of the new Marvel deck-building game called Legendary™. At first, our perspective was that of consumers unfamiliar with deck-building games, but under the guidance of the game developers, we quickly mastered the game’s concepts and were able to assist the team with promoting the fun of the game in the market. 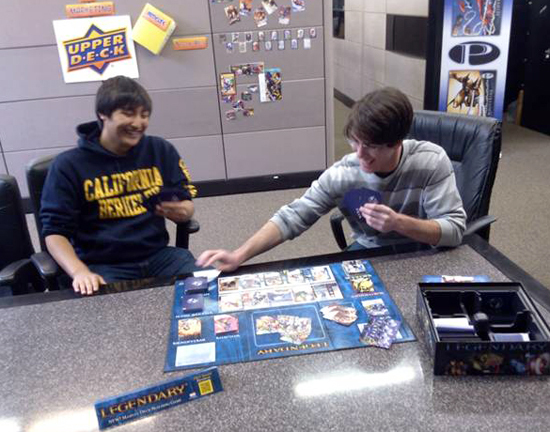 Taylor and Bill enjoyed some “Legendary” battles as they learned the popular new game from Upper Deck during their internship with the company. “Although Legendary™ contains over 500 playable cards with more on the way, the game itself is very easy to learn. The game brings to life some of Marvel’s most memorable characters and the original artwork is beautifully crafted where players often stop to admire some of the scenes depicted. The game contains competitive and co-operative elements, appealing to the cutthroat and the collaborative player; but more than anything, it is just a lot of fun to play! If you are currently enrolled in college and are interested in an internship opportunity with Upper Deck, please email your resume to UpperDeckMarketing@upperdeck.com along with information on your availability. We are always looking to bring on a few good interns to help with new products and programs!